California schools are incredibly expensive and competitive, so I decided to apply to mostly out of state schools. However, where was I supposed to start? There are 200+ accredited schools. That is insane. You have plenty of options, but it is incredibly time consuming to check out each one. I listed all PTCAS and non-PTCAS schools and their states. 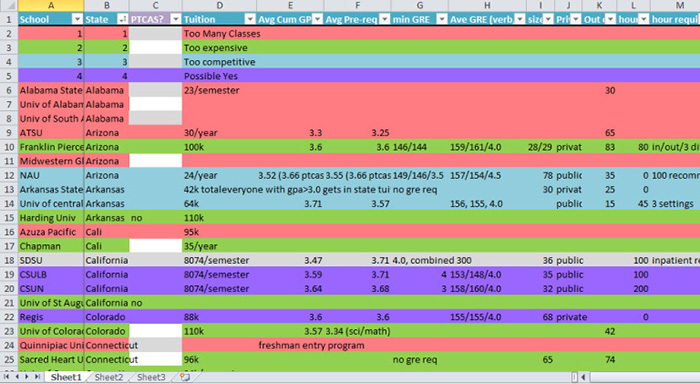 I color coded the schools, depending on whether they had too many pre-req classes that I had not taken, the cost (as out-of-state is usually more expensive), the competitiveness, and whether I want to consider a school. I focused on the pre-req classes first. I already had a few classes to re-take, and didn’t want to take additional classes to apply to some schools. I marked off maybe half of the schools just based on the pre-reqs. Then I crossed off schools that were too expensive. A lot of the information can be found on the PTCAS website, or on individual school websites. Here’s the file for the spreadsheet, based on 2014-2015 application cycle information – The numbers WILL BE DIFFERENT, so use this as a basic guideline. I removed the colors, so you can feel free to color code based on which schools work for you. A lot of schools don’t have much information because I did not have the right pre-reqs taken for that school and didn’t bother filling out the rest. Once I narrowed down my list to around 20-25, I wanted to find out more details about each school. Takes AP Classes for Pre-reqs? Averages or takes highest grade for repeats? Considers Last 60 Hours GPA? 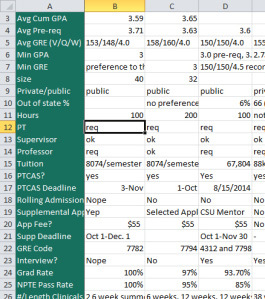 When the list was down to 15 or so, I made another sheet to calculate my GPA for each school. I had to email most schools to find out whether they would take my highest grade for the class that I repeated, or if they would average both of the grades. 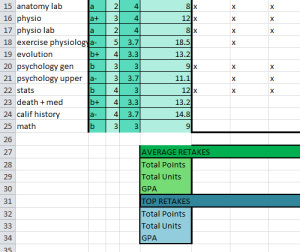 I included the pre-req courses, my grade, the units, the corresponding grade points for my grade (so A = 4.0, A- = 3.7, etc), and marked the classes required by each school. At the bottom of each school, I calculated the GPA by adding the total number of grade points (multiply each unit by unit points, and add together for each class), and divided by the total number of units. Each school required different pre-reqs, and some schools took the higher grade for the classes that I retook, so it was nice to see everything laid out nicely. I compared my GPA with the average GPA, which helped me decide which schools I thought I had a chance of getting into. Seeing all the information side by side was really helpful. Hopefully this helps you narrow down your list of schools! Do you have any questions? Please ask them below!